Have you ever bought a few beautiful mini-skeins at a yarn festival ... and afterwards kept them for quite a while because you didn't actually know what to do with them because there was not enough yarn for a complete project, but they were too beautiful to use up for a scrap project? Well, in 2015 I bought 5 lovely little skeins dyed by Frau Wo aus Po at Wollefestival in Cologne. Each skein weighed about 25 grams - not enough for a pair of fingerless gloves or let alone socks. Then - while participating in a sock knitting KAL - I learned how to do intarsia in the round (see this blogpost to see my first intarsia sock) and I knew that this was a way to incorporate one of these mini-skeins into bigger project without resorting to stripes. 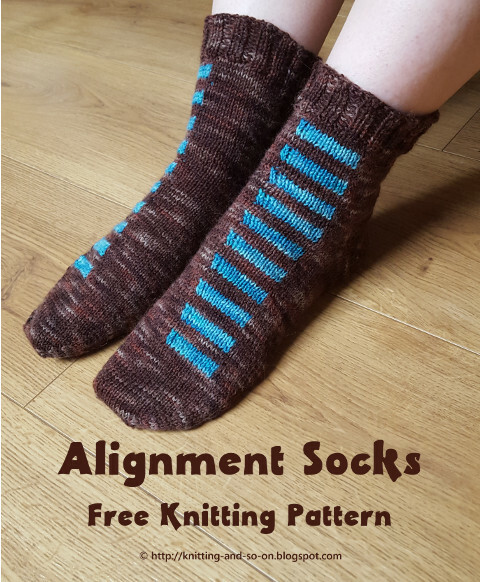 The Alignment Socks are knitted toe-up with a short row heel. The pattern is written in a way that you can adapt it to your foot size - even in a way that you don't have to knit a swatch. Judy's Magic Cast-On is a technique that gives you live stitches on both sides of your needle - it is generally used for toe-up socks (e.g. in this pattern), but it can be used for other purposes as well. Here's a written description (from Knitty) and here's a YouTube-video by Cat Bordhi and another YouTube-video by Very Pink Knits. with yarn-overs before turning: as shown in this YouTube video by Julia farwell-clay. I used the method from this video. Basically you knit back and forth even though your stitches are arranged in the round - and you have to consider rounds in pairs - one RS row and one WS row. You start with your main color (MC) on the RS, then - as in normal intarsia you change (by twisting the yarns) - to contrast color (CC) and knit your CC part, After finishing this you turn your work, make a yarn-over and do the WS with CC, when you get to the MC part you change back as in normal (flat) intarsia to MC. Cutting a sock template of your feet: To make the finished piece fit your feet, it is useful to measure your feet and to cut out a card template. Here's a blogpost at knitbettersocks.blogspot.com that explains the idea. If you want to knit a pair for someone else and cannot get a template, here are standard shoe size templates. It's always a good idea to place something according to the Rule of Thirds. 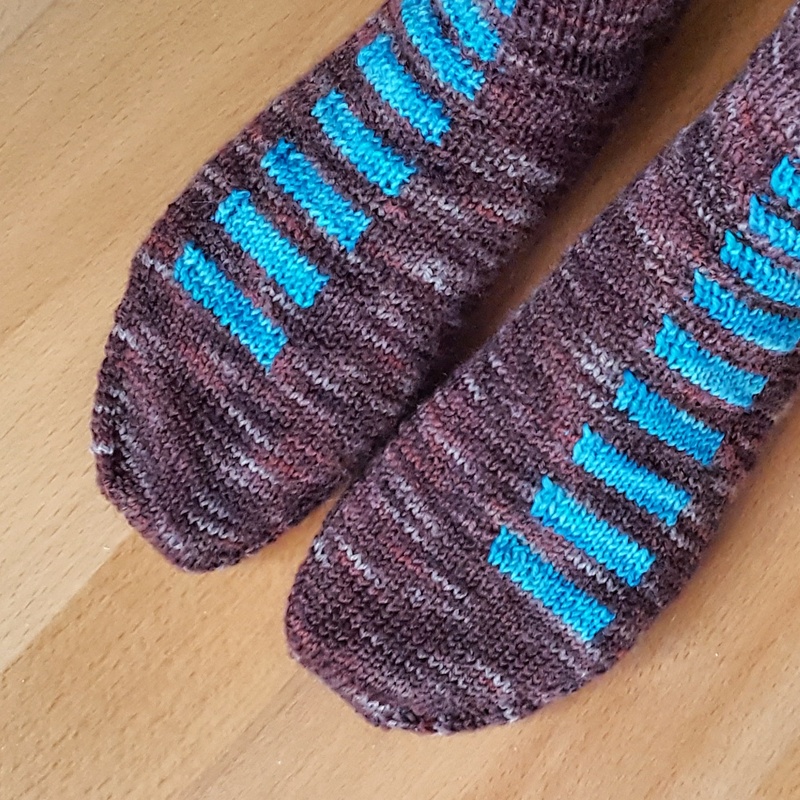 That's why I wanted to place the CC rectangles around a line that is one third from the side of the sock (see picture below). Here's a short table that shows the place and size of the intarsia rectangles for stitch numbers between 56 and 64. Please note, that the shoe size is only a rough guide - I looked it up in a table that was freely available on the internet. 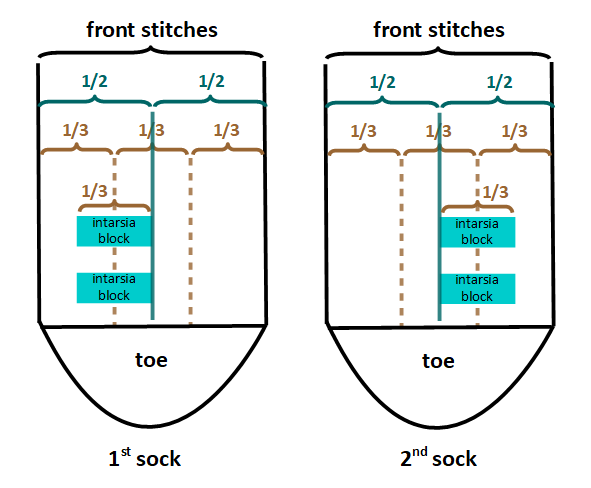 Here's how you calculate the placement in general: For both socks, the width of the intarsia block is 3rd of the width of the front part (or on sixth of the total number of stitches). For the first sock, the intarsia block starts right in the middle of the front half of your sock. For the second sock, the intarsia block ends right in the middle, i.e. you need to start after one sixth of the number of the front stitches (or one twelvth of the total number of stitches). See picture below. Round 1: Knit all - while placing stitch markers after 12 sts and at the end of the round - alternatively divide the stitches on your needles in such a way that you know exacly where one half of your stitches are. Repeat rounds 16 to 19 until the sock is wide enough. Remove the marker that marks the middle of the round, but leave the one that marks the beginning of the round. The foot is knitted party in the round (when knitting plain rounds in MC), and partly back and forth (when knitting intarsia). Repeat rounds 5 to 12 to desired length just before the heel. If you made a template as suggested above, your sock should reach to the ankle bone line. Start with the heel. 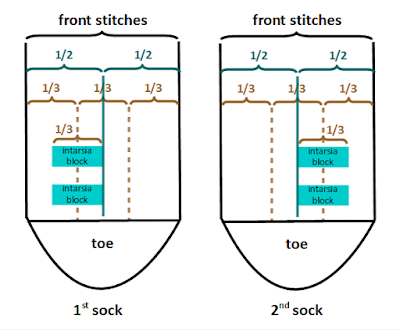 Divide your stitches into two equal parts - front and back or instep and sole. The short rows will worked back and forth - only be worked over the sole part, i.e. the half without the intarsia rectangles. The heel is knitted in MC only. Knit two rounds - making sure to knit the double stitches that result from the shadow wraps as one stitch. Repeat rows 3 and 4 until the row length is the complete back of the sock. On the front of the sock, you can see that you have knitted 4 complete rounds in MC. That means that when continuing the cuff, you have to start with an intarsia block again. 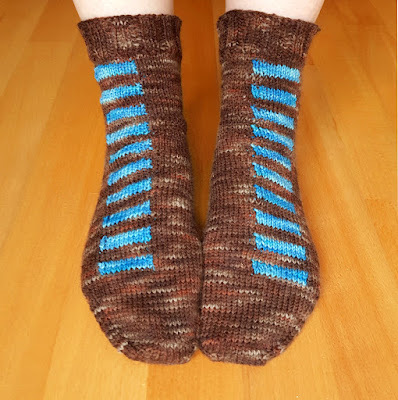 Knit rounds 1 to 8 of intarsia pattern of the foot until desired length. Finish with 12 rows of k2-p2-ribbing and bind off loosely in pattern. Weave in ends. When knitting the second sock, make sure to start the intarsia block mirrored to the first sock - as described in the table above. Wonderful. What a great way to use mini skeins. Thank you. I'm glad I found something nice to do with them!